Food goes back a long way with G&G Chef Robin Pridgen! She gained local fame in her neighborhood for making the best green bean casserole at the age of 12. This set her on trajectory for a life immersed in food. She graduated with a degree in Foods and Nutrition and began a long career in the airline Food and Beverage industry. She helped design menus and create recipes. She reminds us, "not all airline food is bad!" This gave her the chance to travel the world, experiencing food from all different cultures. Those experiences helped shape her personal life catering private parties and charity dinners (as you can see, she is a multi-tasker). Now, she can add G&G chef to an already impressive resume! 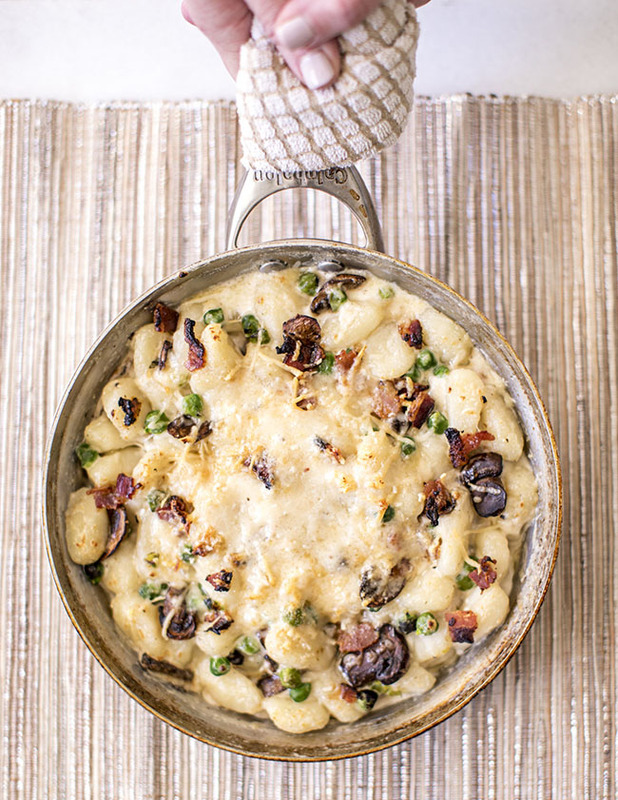 Chef Robin is on our menu this week with an extraordinary dish: Parmesan Baked Gnocchi with bacon, mushrooms & peas in cream sauce. Chef Robin has pursued a life working with food because of the emotional moments and memories it creates. When writing recipes she thinks about making them delicious and approachable. Over her career, she has received a lot of cooking advice. The best she's received yet? "Don't be afraid of the food you're cooking. Get up close and personal with it. Look at it, taste it, listen to it, take a big whiff of it - but most of all get your hands in it! If you only want to use the very tip top of your fingers with your pinkie extended because you're afraid of getting your hands dirty, don't blame the food when it doesn't taste like much..."
She says this is the trick to her gnocchi recipe. So order your Parmesan Baked Gnocchi and get your hands dirty!